I did take some pictures during Christmas this year, although not many. 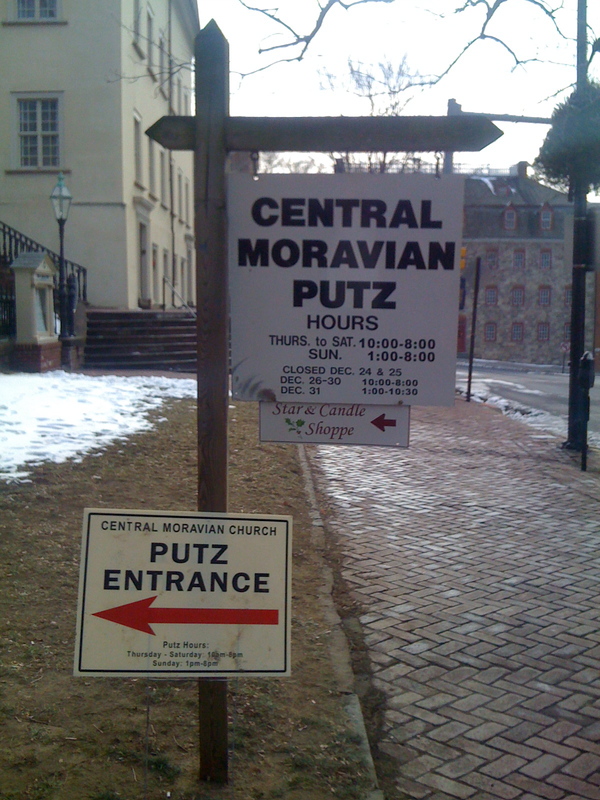 On our way to and from our parking spot, we passed by Central Moravian Church, which every Christmas has a Christmas Putz (from the German putzen, meaning "to decorate"), which is a retelling of Jesus' birth by means of narration and music. It changes at least slightly every year, and I was a bit sorry I didn't have time to see it this year. When I walked by the sign, I immediately thought of Pinky and the Brain, and giggled to myself. My mother, who knows me well, looked at me and said, "You're giggling because you're thinking of a putz having her own entrance, aren't you."